To be honest I can’t remember when I first got in touch with Lara. I think it was Frau Gold that introduced me to her. What I do know is that they are both talented seamstresses. Lara owns a fabric shop in Berlin (and on Dawanda). I’m so sure that next time we go to Berlin (we love that city a lot) we’ll visit 1000 Stoff. Lara has a great fabric taste as you can tell from her shop. Maybe I’m glad that it’s not close to my home. I would probably buy everything she sells! What ever Lara makes has a special touch. 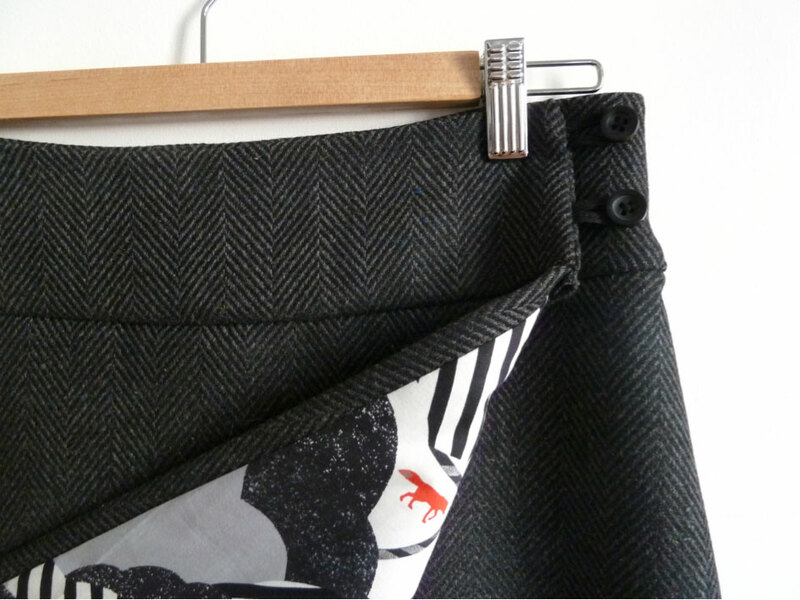 Just like this wrap skirt. 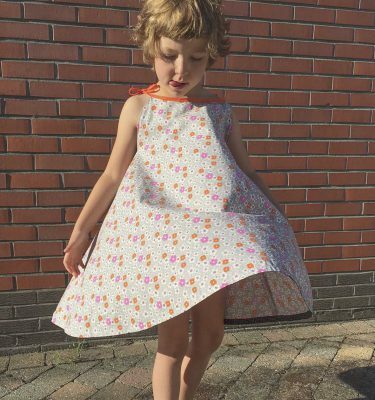 Thanks a lot Lara for this beautiful Nina skirt hack! I love wrap skirts so I might have to copy your idea one day. 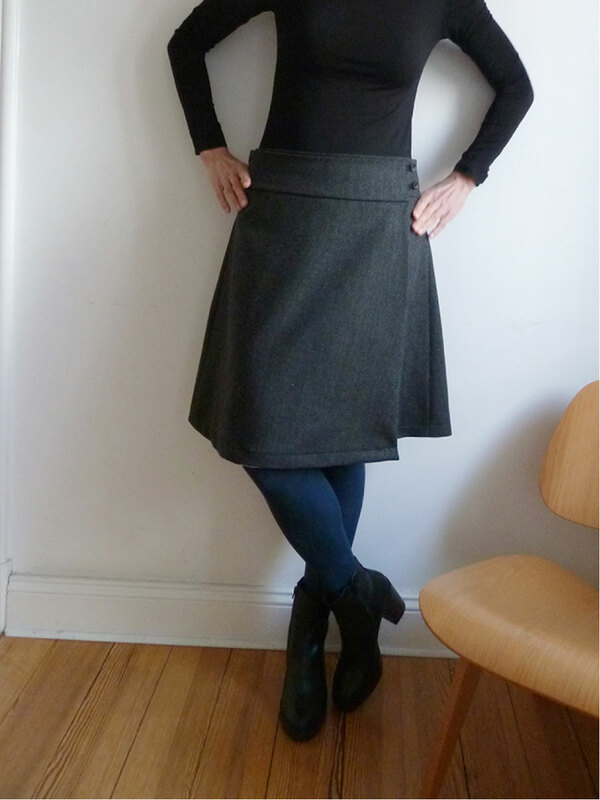 I love wrapped skirts and I love the Compagnie M. pattern fort the skirt Nina (as you can see here). So why not combine these two? This was my starting point for this project. It was not really difficult to adjust the pattern. I didn’t change he back part but divided the front part into two symmetrical pieces ending almost at the side seams. This increases the amount of fabric needed but from my point of view it is absolutely worth it. Concerning design I am more or less a very reduced kind of person. But I love hidden details. That is why I decided for an attractive lining in the overlapping layer. You can get a glimpse while I am walking or moving. 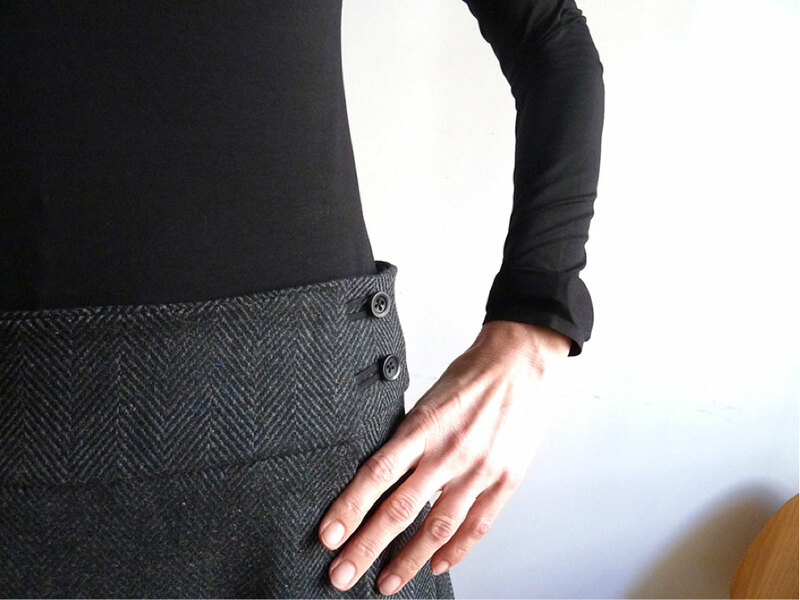 The main fabric is 100% wool with a nice herringbone structure, the lining is one of my favorite Echino sateen cotton fabrics. Its smooth surface is a nice contrast to the velvety wool. The pattern fits perfectly. Except for the transformation into a wrapped version there was no need for further adjustments. I like the mellow a-shape and the length. 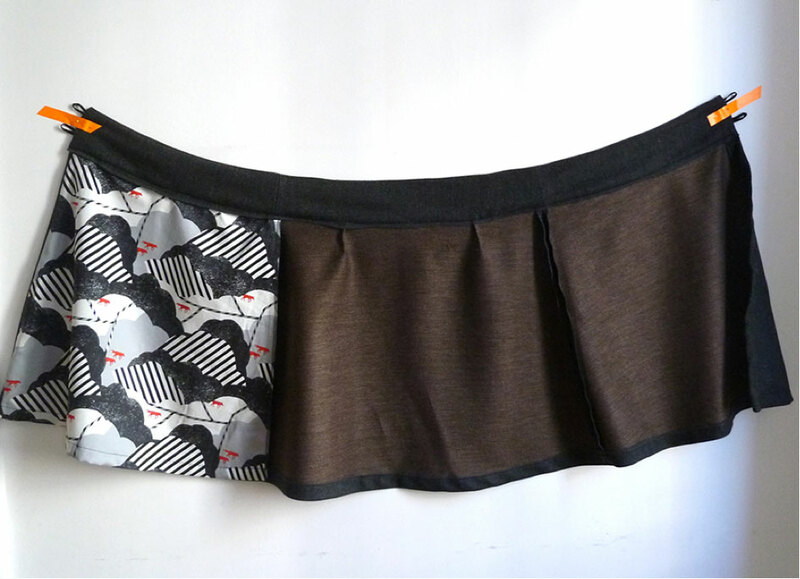 To keep it as simple as possible I decided against the whole range of pockets that Marte included in her design. No zipper required! Two buttons on each open side do the job. At the moment it is definitely one of my favorite pieces in my wardrobe and I am already designing more Ninas in my head! Love the skirthack! Beautiful choice of fabrics! I love this hack too! Actually I adore it when people change my patterns like Lara and you did! Oh this fabric i love love love!! Heel mooi die voering is een leuk detail! Great what she’s done with the pattern and I agree, she knows how to give it a special touch! Great!